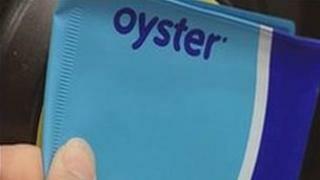 Some passengers have been double charged when topping up their Oyster Cards, BBC London has learnt. A Freedom of Information request shows Transport for London (TfL) has refunded £40,000 this year to customers who have been over-charged by faulty machines. The information also shows there have been 2,421 complaints in 2010 about being double charged when adding credit to the electronic travel smartcard. TfL is advising people to check their bank accounts after topping up. TfL explained that it could not be aware of any over-charging until the issue was reported by a passenger. The Freedom of Information requested information shows the machines at London Bridge, Victoria, Liverpool Street and King Cross stations led to the highest number of complaints. Shashi Verna, from TfL, said: "We monitor the system continuously to make sure the problems are not becoming bigger, and there is no evidence they are becoming bigger. "But we constantly check the screens on ticket machines and how the ticket machines are set up to minimise these problems."